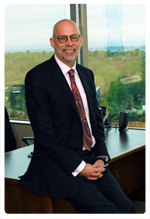 David T. Dyjack, Dr.PH, CIH has been named NEHA's executive director and chief executive officer effective May 4, 2015. Dyjack’s 30-year career includes expertise in environmental health, emergency preparedness and response, public health informatics, infectious disease, workforce development, governmental infrastructure, maternal and child health, health equity, and chronic disease. A board certified industrial hygienist, Dyjack also has advanced degrees in public health with a doctorate from the University of Michigan and a master’s degree from the University of Utah. He most recently served as the associate executive director for programs at the National Association of County and City Health Officials managing the organization’s grant and contract portfolio and 75 health professionals in support of the nation’s 2800 local health departments. Dyjack has a wealth of management and leadership experience ranging from local health departments to federal agency collaboration. “David’s background in both environmental health and association management are an ideal fit for NEHA’s new executive director. We are extremely excited about David joining us as we chart a course to further advance and elevate the environmental health arena both nationally and globally,” said NEHA Board President Carolyn Harvey.